- I restock girls' Indian outfits during our annual India trip. Since they are growing so fast, by the time Diwali comes around, sometimes they have outgrown their outfit or we end up attending more than one- or two Diwali events and I need multiple options. - Also, fall is at its peak around Diwali here in Boston, and I prefer to dress them in something festive yet warm. So when I run out of their Indian outfits, my solution is a modern twist to traditional Diwali outfits. 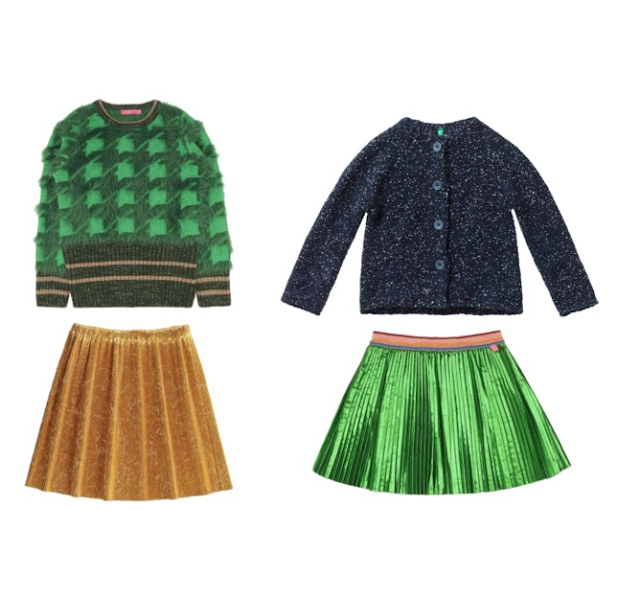 Mixing and matching these shiny gold and green skirts with a cozy jumper and cardigan seems like a great idea! The girls will stay snug, their skirts will completely blend with rich colors and textures of most Indian outfits, and they will definitely be able to wear these outfits again during upcoming holiday celebrations all the way through to New Year. Win-Win-Win.